Published: December 1, 2014 • Modified: October 31, 2018 • by Author: Analida • Word count:651 words. • About 4 minutes to read this article. Frico? So, what exactly is Frico? Simply put, sliced potatoes tossed with olive oil, onions and Parmesan cheese. So humble, yet so delicious! 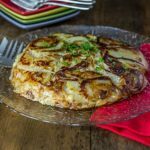 It reminds me a little bit of the Spanish dish Tortilla Espanola without the eggs. According to one of my Italian friends Frico is Italian rustic cuisine at its best. It’s from the Fruli-Venezia Gulia region of Italy located in the northeast bordering Austria and Slovenia (part of the former Yugoslavia). The eastern coast faces the Adriatic Sea. The north is known for its ample pastures and consequently excellent meat and dairy products. Frico is an excellent example of European frugality. The dish makes good use of leftover food items. Better yet, it can be served as an antipasto or a main course. By the way, when I say antipasto I don’t mean the “salad” one often finds in Italian delis in this country. The true meaning of the word antipasto is a dish that comes before the pasta course. In Frico simple ingredients unite to create a tasty meal in about 30 minutes. Once again, according to my Italian friend, the cheese traditionally used for Frico is Montasio, a creamy regional cheese protected under P.D.O. (product denomination of origin). I can’t get Montasio where I live, so I adapted the recipe by using a good quality Parmesan cheese. Frico goes great with a side of mixed greens and a nice glass of chilled Pinot Grigio, just a suggestion. The crispy layer gives way to soft, melt in your mouth potatoes with a crisp nutty taste of Parmesan cheese. Don’t be intimidated by the amount of cheese required, it blends so well with the potatoes and the onions. The combination of flavors work so well together, that no one flavor overpowers another one in this dish. By the way you can use a cheese that is less strong if you prefer. However, whichever cheese you select, just make sure it is one that does not melt easily. When making Frico, I like to caramelize the onions slightly to bring out their natural sweetness. I also like the potatoes to have a slight crispiness to add a layer of texture to the dish. The cheese should be added a little bit at a time to allow it to combine well with the potatoes. Note: the potatoes should be slightly crispy on both sides, but not all the way through. I have a great dual pan that I use for this purpose. If you want to explore some other Italian dishes or bookmark them for later here some easy recipes to try. When I am pressed for time I love to make the quick and easy marinara sauce with basil. 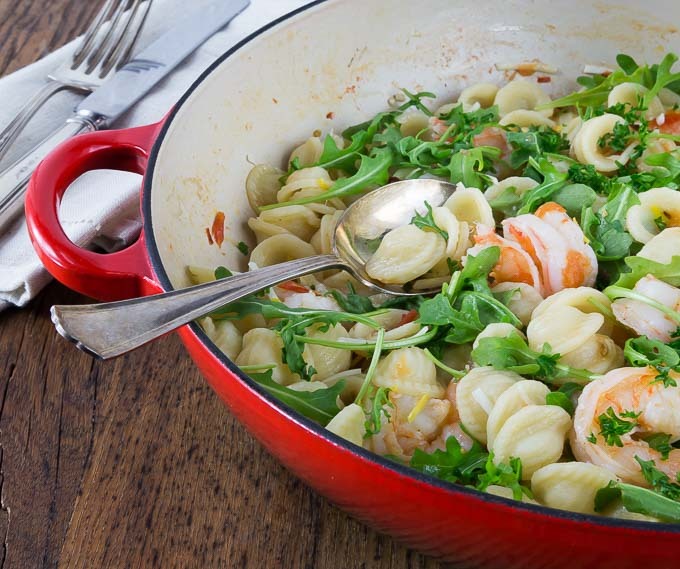 If you want a little spicy and savory flavor try this orecchiette with shrimp, fennel and arugula. 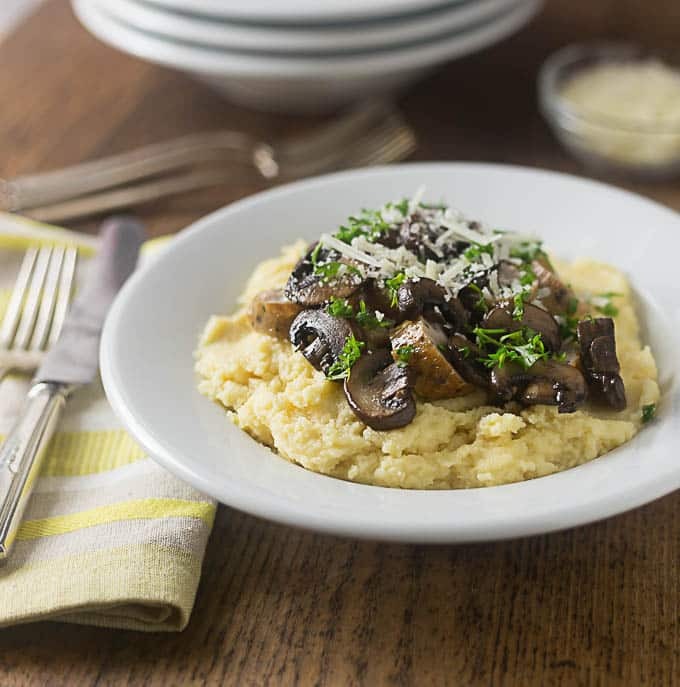 If you are after some rich comfort food them you have to try this east polenta with sausage and mushrooms. Enjoy! 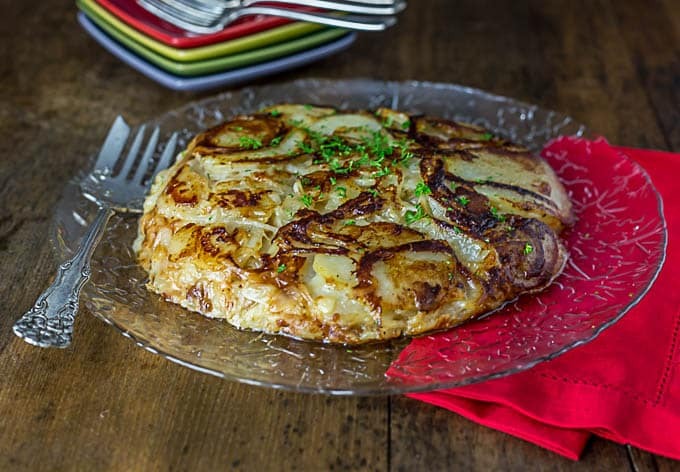 Here is a rustic Italian dish made with potato, onion and lots of Parmesan cheese. These simple ingredients come together in one fabulous dish. Heat olive oil and toss in the potatoes. Cook for about 5 minutes turning frequently. Add onions, nutmeg and pepper and continue to turn until onions are translucent. Slowly begin to add the Parmesan cheese 1/4 cup at a time stirring constantly. Allow the potatoes to brown on one side and then turn to brown on the other side. You use a large plate to do this, even better if you have a dual pan. The cheese and potato mixture should form a light crust on both sides. I like to caramelize the onions slightly to bring out their natural sweetness. I also like the potatoes to have a slight crispiness to add a layer of texture to the dish. The cheese should be added a little bit at a time to allow it to combine well with the potatoes. Potatoes should be slightly crispy on both sides, but not all the way through. Thanks Amy, yes it is simple and delicious. It goes great with a salad. You are so welcome Dee! I hope you get to try them. 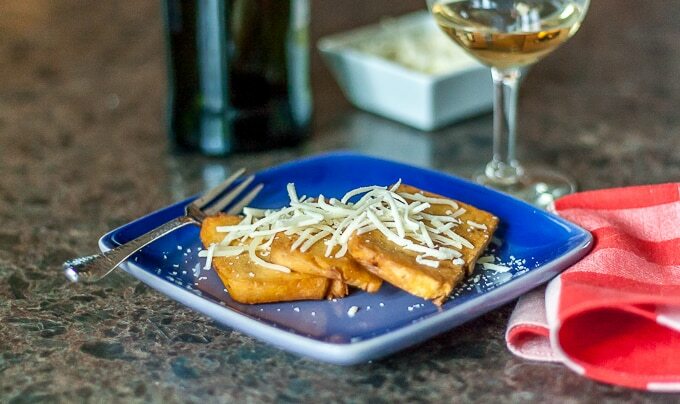 I love this recipe Analida…so simple and it looks absolutely delicious! This would be great for dinner with a light salad. Definitely trying it! I always learn so much here Analida. 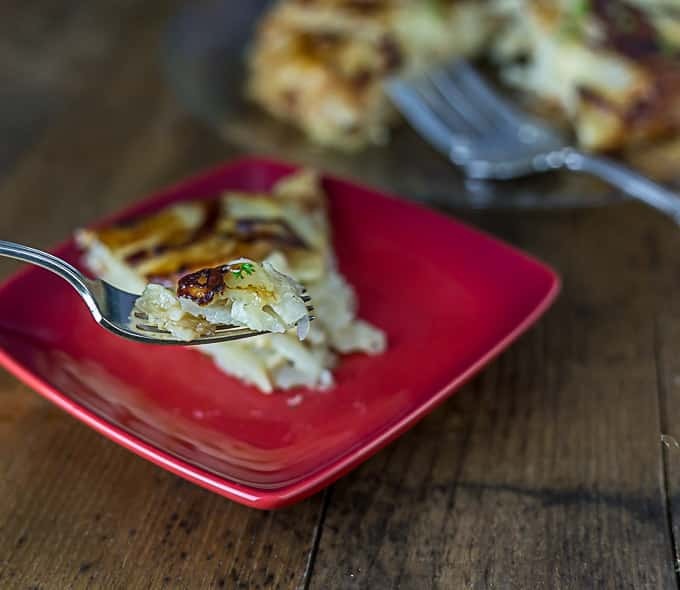 I would love to try this Italian potato pie! Never heard of it before and sounds so simple and delicious. Would love to try this! Thanks Allie. It is delicious and pretty easy to make too. I love this Analida! Potatoes are my weakness and this has my name written ALL OVER IT! Definitely need to add this to the menu soon!! Thanks Dini. It is a great dish! Take care. This sounds amazing – I have just one question. If you add the cheese after you flip the potatoes, how do you keep stirring the mixture. Isn’t it set at that point? Laura, thanks for catching this. My bad!!! I had one of the steps out of order. Amazing!! I love the golden , crusty outside! Delicious! This looks so simple and delicious! All I need is a salad on the side and I’m good to go! OMG! This looks amazing! Pinned. I definitely need to make this. Like this weekend. LOL!!! it is really good. Goes great with a salad!